If you’re on the hunt for low carb shrimp recipes, this one is for you! Packed with flavor, and nutrient dense ingredients, like black beans, avocado, and marinated shrimp. Prepare marinade by adding all ingredients to a blender, and blending until cilantro is chopped up finely and the sauce is a nice bright green color. Split your marinade into 2 containers. Use one to marinate the shrimp, and reserve the other to use as a topping. Add the marinade to defrosted shrimp. If you’re shrimp aren’t thawed, it’s easy to thaw them by adding them to a colander and running them until slightly warm water for a few minutes. Put the shrimp aside until the rest of the ingredients have been prepared. While the shrimp are marinating, chop your cauliflower into chunks (I find smaller chunks work better in my food processor). Add the chunks to the food process, being sure not to overfill it. If you add too much cauliflower at once, it will be hard to get it evenly chopped. If you have a large food processor, you can probably chop all of the cauliflower in 2-3 batches. Heat a skillet over high heat, and add 1/2 tablespoon olive oil. Once the skillet it hot, add the cauliflower “rice”. Don’t overfill the pan for the best results. It only takes a couple of minutes to cook, so if you need to, just cook your “rice” in two batches. While the cauliflower is cooking, season with cumin and sea salt. Stir the cauliflower frequently, and remove from heat after 3-4 minutes. Heat another skillet over high heat, and add shrimp. Use a spatula to lay the shrimp out across the pan to ensure even cooking. Flip, and cook the otherside, being sure not to overcook. The shrimp will only take a couple of minutes per side. 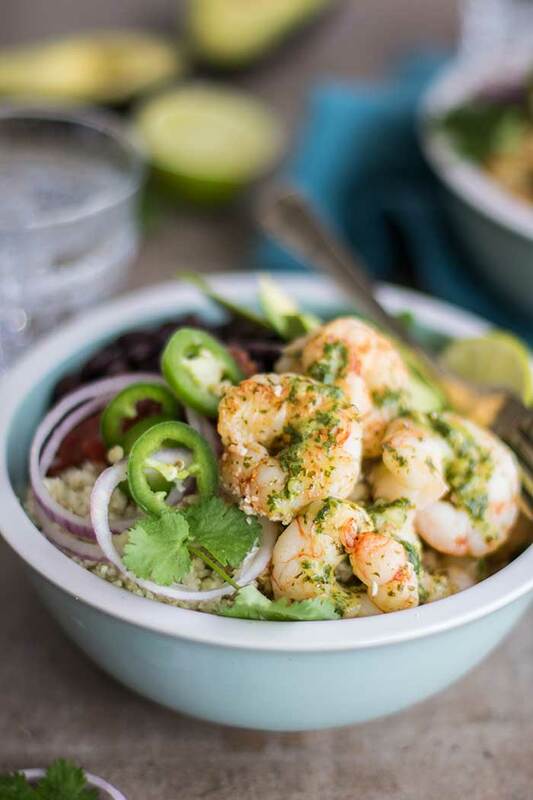 Layer cauliflower rice, (heated) black beans, and shrimp, and then top with salsa, avocado, onion, jalapeno and extra cilantro. Drizzle with extra cilantro lime sauce.